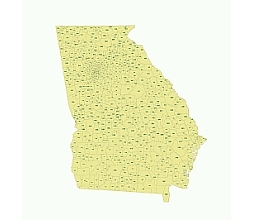 Editable royalty-free map of Georgia, GA in vector-graphic online store. Georgia is a state located in the southeastern United States. It is bordered on the south by Florida; on the east by the Atlantic Ocean and South Carolina; on the west by Alabama and on the north by Tennessee and North Carolina. Colleges and universities in Georgia.Vector map. 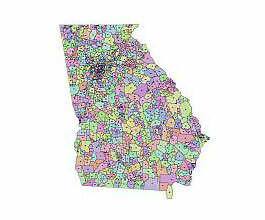 Georgia vector county map, colored. Preview of Georgia State vector road map. Georgia old map. 1849. Non vector map. 1571 x 1859 px image.